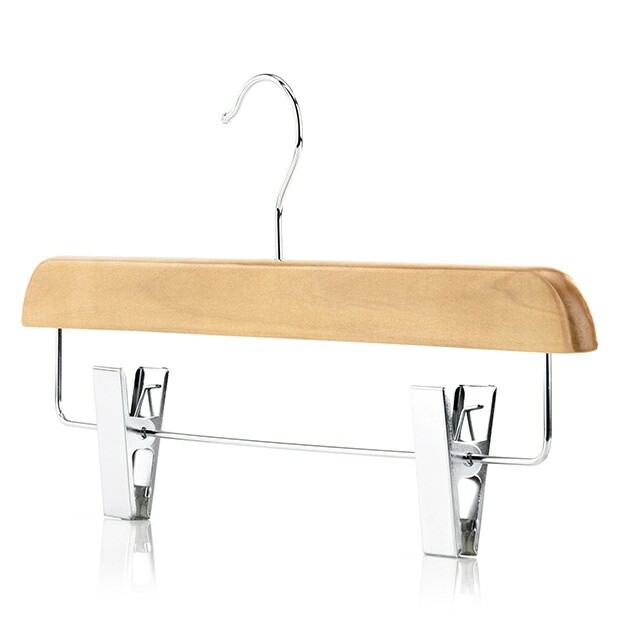 Quality clip hangers made from strong and durable maple wood, with a smooth, natural varnished finish, for a classic appearance that will look great in any setting; both at home or in a retail outlet. Narrow, space-saving profile reduces wardrobe clutter, and frees up valuable clothes rail space. Two adjustable width, waistband clips, with soft, rubber lined jaws that will provide a secure hold, and prevent clothes marks and dimples at the place of attachment. Completed with a chrome, 360° swivel hook that allows you to position the hanger in any direction, and neatly align your clothes. Ideal for securely hanging trousers and skirts. Adjustable width soft lined clips. Size: Width 36cm (14.2") approx. i was really pleased with these trouser carriers and was about to order more when i saw 3 for £3.00 in Matalan. Not quite so much wood but still more than adequate. Bring down your prices for smaller amounts and you would be the winner.